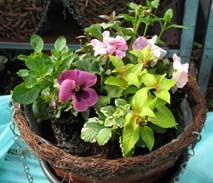 Growing plants in hanging baskets is the most flexible and instantly rewarding form of gardening. The entrance to your home isn't properly dressed unless it proudly boasts one or two welcoming hanging baskets. There are plants to suit every position and every colour scheme from elegant, calming, cool shades to vibrant, punchy, in-your-face hot tones. Themes don't have to stop at colour coordination either. Our Front Door Collection, with coordinated patio containers, and woven brackets to compliment your chosen hanging basket design, will help you create a new and exiting floral display. The texture and composition of the materials we use in these hanging baskets and patio containers, provides such a wonderful natural harmony for both your summer and winter planting themes. Huge range to choose from for Summer and Winter Hanging Basket displays - Click on the Hanging Basket box on the top left menu section to view the full range and look in the wall basket and patio container section for a co-ordinated display. - Choose your basket. 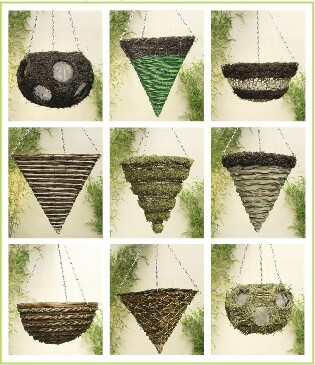 Our exiting new range of natural woven designs is perfect for both Summer and Winter displays. They all have an integral liner and the natural materials help to protect the root zone by diffusing excessive heat in the summer months while providing valuable insulation properties in the winter months. A 14 inch top hanging basket is the best size to use. Smaller ones dry out to quickly in the summer heat and the larger baskets are very heavy to hang and require a substantial quantity of plants for an effective display. Another advantage of the hanging cone shaped baskets is you don't have to plant through the sides of the baskets. The pleasing natural materials of the basket contribute to the overall visual impact. A few carefully chosen trailing plants around the rim of the basket will gently cascade and compliment the baskets natural materials. - Now you have to get your hands dirty - but you can wear gloves! Place your hanging basket in a bucket for support and a short way up from the base of the basket make a small cut in the liner to allow the excess water to escape. A small cone reservoir in the base of the basket is ideal for your plants, as the roots of the plants draw on this during warm days and helps to steady the basket in exposed areas. - Fill the basket to the rim with a good quality compost. We mix into the compost some Water Gel Granules at the rate specified on the packet. We then push into the compost Slow Release Fertiliser Tablets so they are evenly placed. In a 14 inch hanging basket we use 5 x 7.5 g tablets pushed in the same as the 5 on a dice. 1. Use a larger bushy plant in the centre. For summer baskets it could be an exiting double flowering Fiesta Busy Lizzie, or fuchsia, geranium or any favourite you have chosen. For winter baskets it could be colourful heather, dwarf conifer or an evergreen shrub. 2. Around your centre plant position your semi trailing plants. For summer use Aztec verbena, bacopa, fuchsia, surfinia, million bells, helichrysum and wonderful scented aromatic nemisia. Viola, pansy, fragrant foliage mints and Ole Fiesta busy lizzie will all add a real deal of interest to your basket. For winter displays you can also use viola and pansy together with primula, euonymus, sedums and dwarf flowering bulbs. 3. Trailing plants around the rim of the basket will complete the planting. 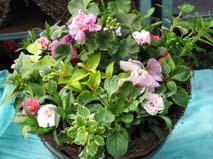 For summer baskets use trailing lobelia, nepeta, trailing million bells, bacopa, busy lizzie, viola and ivy. For winter baskets you can use hardy ivy, hardy viola, euonymus and colourful sedums. If there are any gaps around the roots then sprinkle in compost to fill the gaps or sphagnum moss. Your planting is now complete so water in well, allow to drain and then place the basket in a frost free, well lit environment to settle. As the plants start to grow you can pinch out the growing tip as necessary. 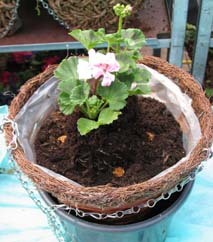 The hanging basket can then be placed outside as soon as the danger of frost has gone. Protecting the basket with our Protection Fleece at night will assist the plants by retaining the warmth the basket has gained during the day. When the basket has got acclimatized to its new home the plants will reward you for the care that you have given them.